Greek Default Watch: How Important is Shipping for Greek Trade? Tourism and shipping are the two most important industries for Greece’s exports, and in 2009, ~57% of Greek exports came from either tourism or shipping. I have written about tourism in the past (see here); now, I wanted to take a quick look at shipping. Shipping enters the current account both as a good and a service: the former refers to the buying and selling of ships, while the latter deals with maritime services provided by Greek companies. To understand Greek shipping means balancing out four separate pieces: (a) the money sent abroad to buy ships versus (b) the revenues generated from the selling of ships; and (c) the money earned by providing maritime services versus (d) the money spent to purchase maritime services (e.g. at ports, logistics, repairs, etc.). If one looks at maritime service exports alone (c), there has in fact been a boom: at the peak in 2008, the Greek economy exported €17.6 billion worth of maritime services, a near doubling versus 2002 (€8 billion). But in net terms, the contribution to the current account grew from €4.4 billion in 2002 to €6.4 billion in 2008 – an important increase, but much less than would be expected from the gross growth in revenues. The reason is twofold: first, Greek ship-owners have expanded their fleets, prompting a capital outflow to pay for these ships. In nominal terms, between 2002 and 2009, ship-owners spent almost €27 billion to buy ships – they also, however, earned around €10 billion by selling ships. 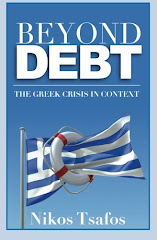 So in the eight years from 2002 to 2009, Greece spent a net of €17 billion on ships – around 2.2 billion a year. Besides the increase in ship purchases, the Greek shipping industry also increased its purchases of maritime services from abroad (d): from €4 billion in 2002 to almost €6.5 billion in 2008 (at the peak). While the services account was still growing, the net increase was smaller than the gross one. 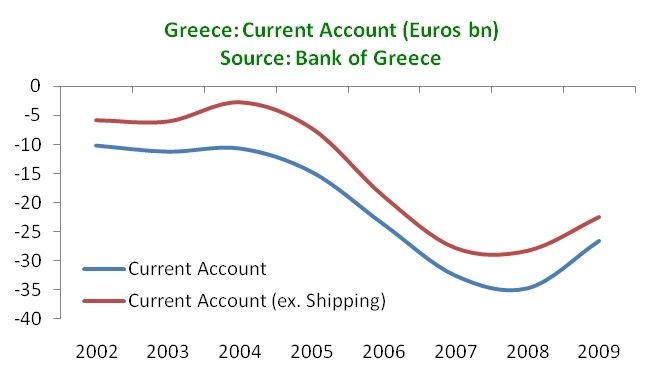 Putting all this together, therefore, shows a more nuanced role for Greek shipping in terms of the current account. The peak contribution came in 2004 and 2005 when charter rates were rising (see receipts) but before the Greek shipping industry started a massive fleet expansion program, which started in 2006 (where ship purchases doubled from €2.3 billion to €5 billion). Once the fleet expansion began, the contribution to the current account shrank. In fact, in 2007, at the height of the commodity boom, the contribution to the Greek current account was no greater than it was in 2002. After the drop in 2009, it was even lower. Of course, there is more to life than the current account: the Greek-owned shipping fleet increased more than 50% since 2002 and shipping companies were able to continuously lower the age of the fleet as a result. 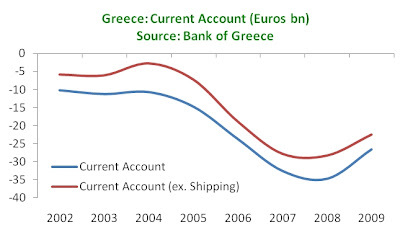 But in terms of the Greek current account, the contribution of shipping has been steady and, after 2005, modest, at least insofar as its ability to constrain the country’s ballooning current account deficit.